I’ve been really getting into grated raw zucchini as an ingredient. I love the mild ‘greenish’ flavour but the best part is all the moisture in the zucchini keeps your salad or whatever lovely and moist. My Irishman had this salad for lunch at work and he was raving about it so much he took a photo and sent it to me. High praise indeed! 1. Combine lemon with 2 tablespoons extra virgin olive oil in a medium bowl. Season. 2. Grate zucchini using your food processor or a box grater. 3. 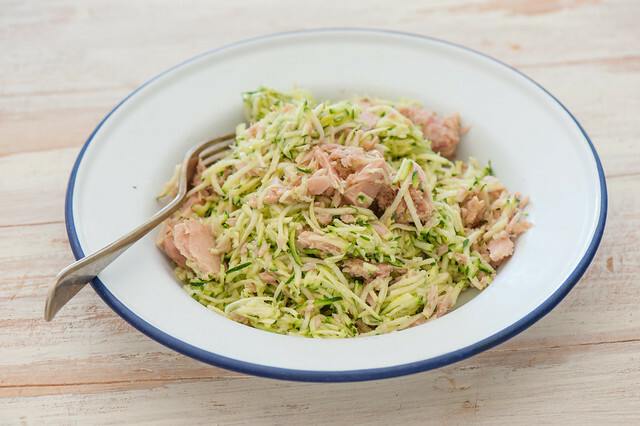 Toss zucchini in the dressing along with the tuna and serve. vegetarian – replace tuna with poached eggs or pan fried halloumi or crumbled salty feta. vegan – replace tuna with chunks of avocado and a handful of almonds. carnivore – replace tuna with shredded BBQ chicken, sliced cooked sausages, pork chops or salami. hot! – use tuna in chilli oil. carb lovers / more substantial – serve with crusty bread and butter. fresh fish – pan fry tuna steaks or other fish fillets and serve with the salad. different veg – use carrots, beets, broccoli or cauliflower or a combination of any of the above. no grater – finely slice the zucchini into strips using a veg peeler or mandoline then slice the strips into smaller slivers. herby – feel free to toss in some flat leaf parsley, basil or mint. can tuna – keep in the pantry. What an amazing dish! Made this for lunch in absolutely no time and it was super yummie. I love this about your recipes – quick and easy but still tasty and healthy. Thank you! I absolutely love the vegan version of this with avocado and almonds. It’s great with mint, and I’m thinking I’ll try it next with cilantro and lime. Thanks!